Interview With The Davidson Brothers, Owners of Davidson Brothers BrewPub In Glens Falls, New York. 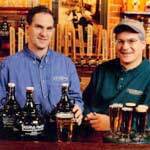 Ever wanted to know more about the brothers behind Davidson Brothers Restaurant & Brewery? Read our exclusive interview with Rick and John Davidson to get a sense of who they are as entrepreneurs, restaurant owners, beer mavens, and local members of the community. Rick Davidson is the Managing Partner of Davidson Brothers Brewpub. John Davidson, Rick's brother and partner in the business, is also a Vice President with the D.A. Collins Companies. 1. Are you native to the Glens Falls Region? Our family has been in Glens Falls and Fort Edward for over 140 years. The two of us were born at Glens Falls Hospital within sight of Davidson Brothers Brewpub. We were raised in Fort Edward - the greatest place to grow up on the planet, graduated from Hudson Falls High School, and attended Adirondack Community College. 2. What are the challenges of running a restaurant? Like any small, family owned & operated business, nearly everything is a challenge - finding the right employees, keeping our customers happy, managing costs... Our biggest challenge at Davidson Brothers is maintaining the face-to-face relationship we strive to have with all our customers as the level of business has increased significantly over the past thirteen years. 3. What is your favorite place or activity in the Glens Falls Region? Rick: Having a bite to eat with a fresh pint of Davidson Brothers Ale at any of the many dozens of great restaurants and taverns serving our beer in and around Glens Falls. John: Same, except doing that after a sixty-mile bike ride around our awesome area. 4. What is your vice when it comes to food you can't resist? Rick: John's wife, Pam, makes the most spectacular mashed potatoes. The Davidson Brothers Black Forest sandwich is a close second for me. John: Fried pickles and buffalo chicken wing soup from the brewpub. 5. What makes a great dining venue? Rick: Definitely. There are so many different dining venues that are truly great. The common element in each is focus. "Match the mood." John: Did you just make that up? I think what Rick means is a venue can't be everything to everyone. Stick with what your customers like. When they're in the mood for Davidson Brothers, give them Davidson Brothers. Rick: And then work to improve upon it. John: Without changing what it is that they like about it. 6. What makes your venue unique from other local restaurants? John: We're the only place with Rick. Rick: And the beer guarantee. John: That too. But seriously, we founded Davidson Brothers with the mission of making our community a better place, so we look at the business differently. Rick, standing on his head: Yeah, like this. John: We've created an environment where customers and employees can have fun together. Check out the Davidson Brothers Brewery Facebook page and you'll get an idea what I mean. Rick: Yeah. Facebook is the only place John & I are on the same page. 7. What is something most people might not know about you? Rick: We're not really brothers. Rick: No, we're actually not. Ask my Mom. John: Your Mom is my Mom. Rick: You really didn't know, did you? John: Can you be serious? Rick: My favorite part is spending seven days a week in my favorite bar. John: My favorite part is there's no Rick at my other job! 9. What do you like to do when you are not working? Rick: I haven't worked since we opened the brewpub over thirteen years ago. And since I don't work, everything I do I do when I'm not working! John: Biking, skiing, spending time with Pam and the kids. Rick: Oh, yeah. I also like spending time with my wife, Kerry, and the kids, but they're usually working here at the brewpub, so I hang out here to be with them while they work. 10. Finish this sentence, "Glens Falls is..."
Rick: Okay. Glens Falls is home to a bunch of terrific people living where life is good. John: The only place these two brothers ever wanted to have a brewpub.